Don’t let it’s size fool you, though, because imagineers were able to pack some very snazzy decor into a very small space. 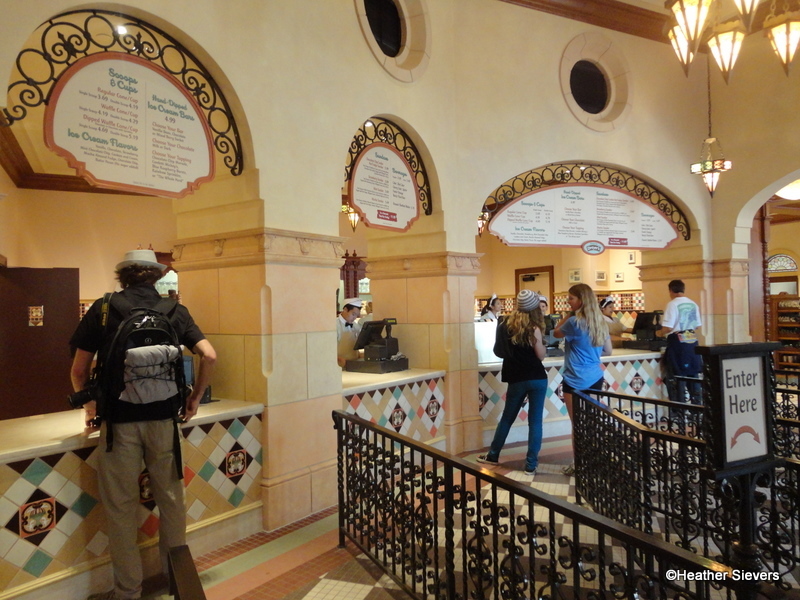 Clarabelle's has three walk up counters for ordering. 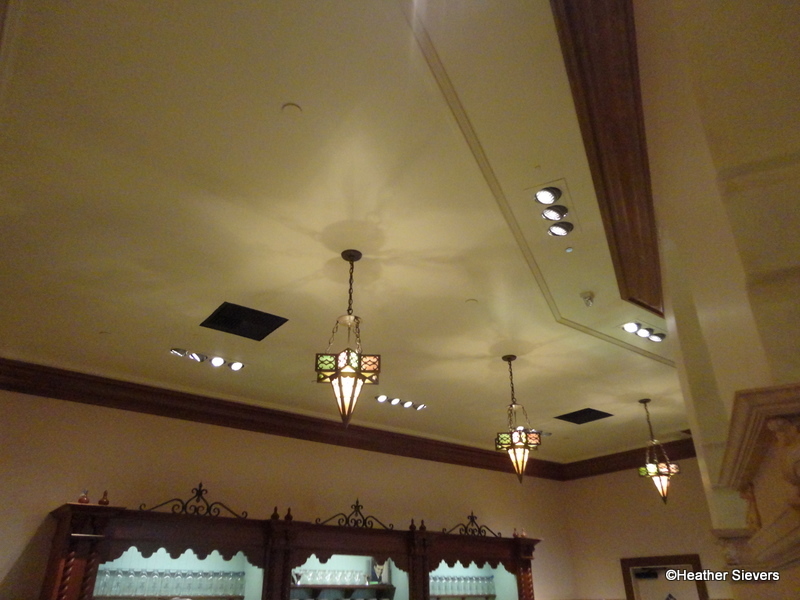 The first thing that I noticed when I walked into Clarabelle’s was the lighting. Each of the light fixtures here are designed to look like ice cream cones. 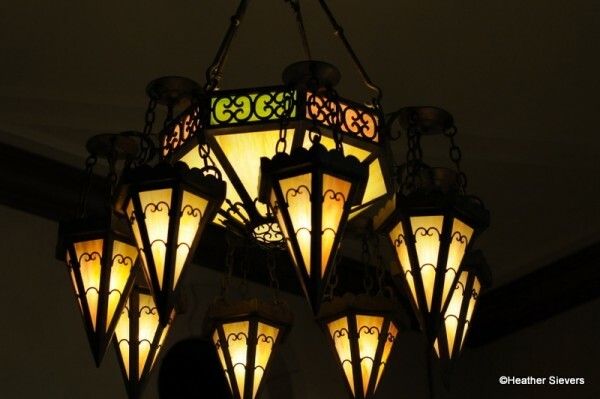 There are individual “cones” as well as a full chandelier hanging from the center of the room. The glass is colored, giving off a lit stained glass effect. So pretty! 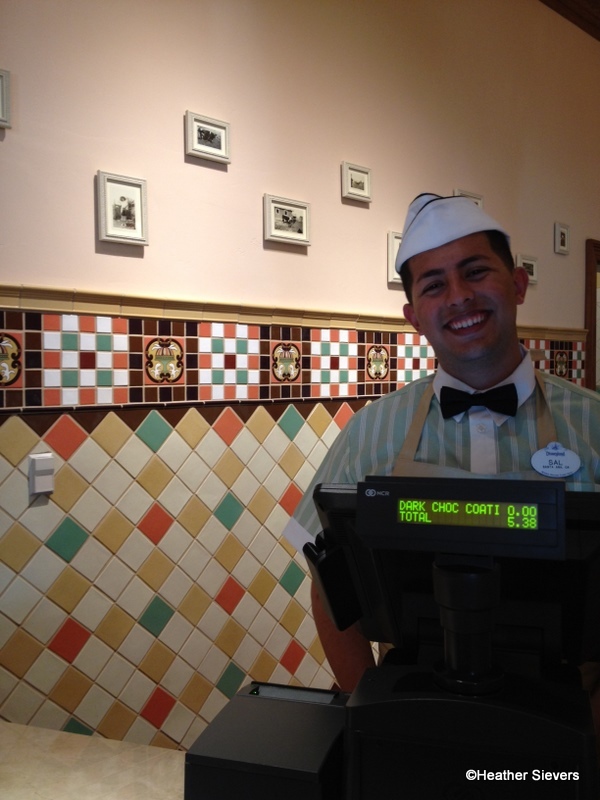 Because I wanted to know a little bit “extra” about the decor, I took to asking this fantastic cast member, Sal. He helped out a ton by explaining the little details. Cast Member, Sal, shares some fun details! Now, on to the secret of the tiles chosen here at Clarabelle’s. 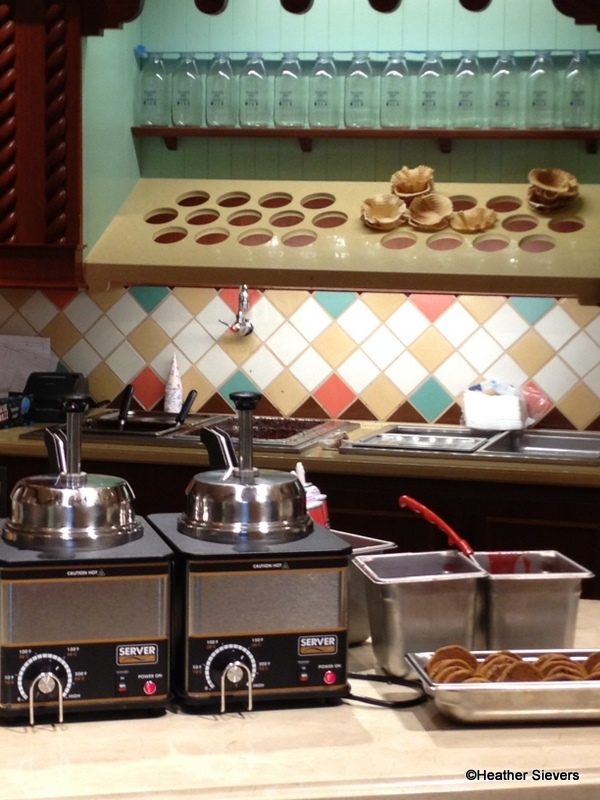 Each one represents a color of the types of ice cream served here! The white = vanilla, brown = chocolate, tan = mocha almond fudge/butter pecan, pink = strawberry, green = mint chocolate chip. 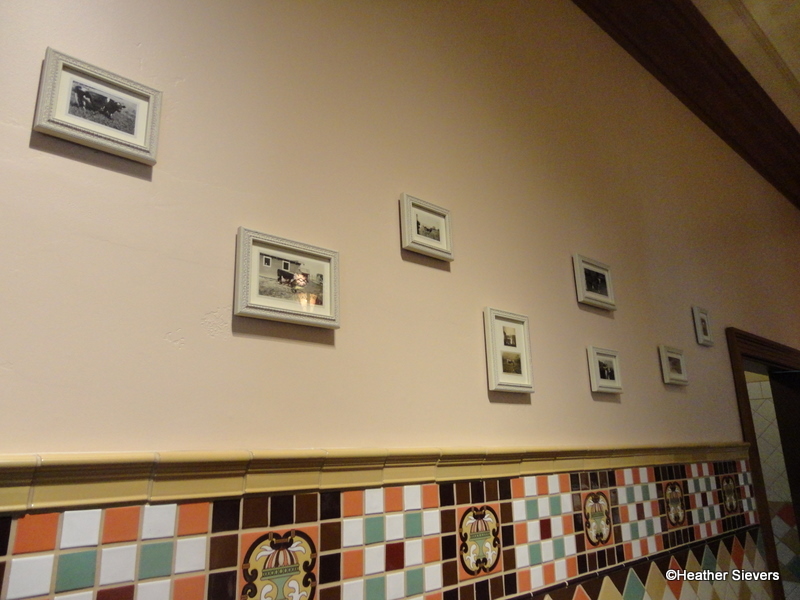 AND the dark and lighter brown tiles above on the cow photo wall represent dark and milk chocolate for the hand dipped ice cream bars! 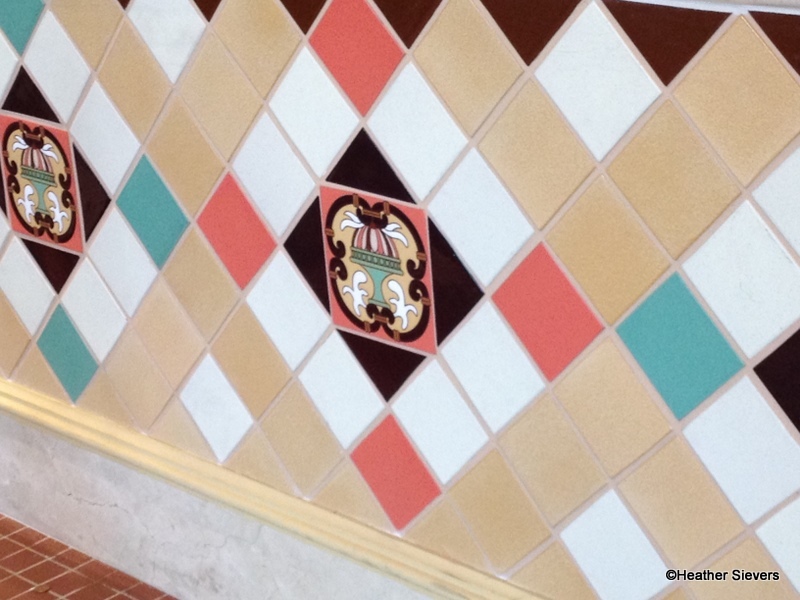 Another gorgeous feature of Clarabelle’s? The stained glass window above the doors. From the outside you can see it; but it’s not until you get inside and can see the sun shining though that you see the detailed design that includes ice cream cones and an ice cream sundae. The ice cream service area is located directly behind the registers, and there are several cast members waiting to scoop your cone or dip your bar! 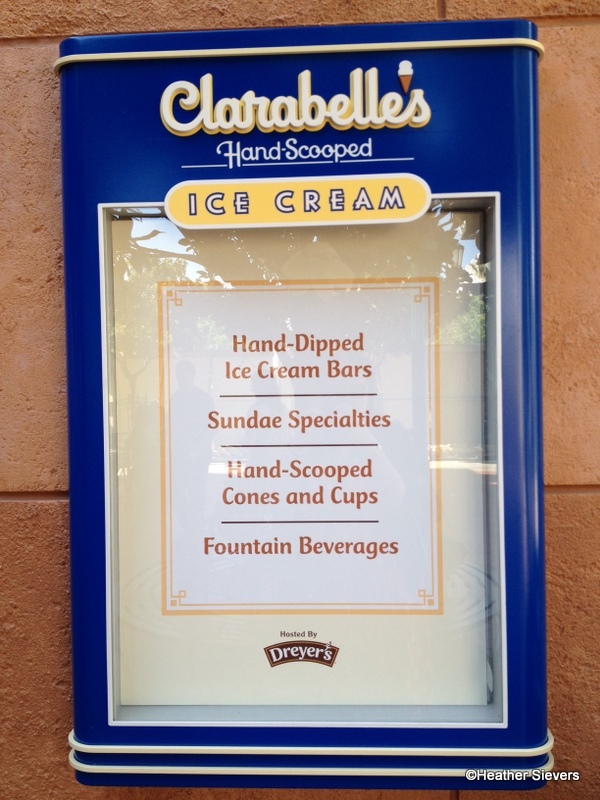 All of the ice cream served here at Clarabelle’s is provided by Dreyer’s. You can get scoops, cones, waffle cones, waffle cups, waffle cones dipped in chocolate, waffle cups dipped in chocolate, and a variety of specialty sundaes. 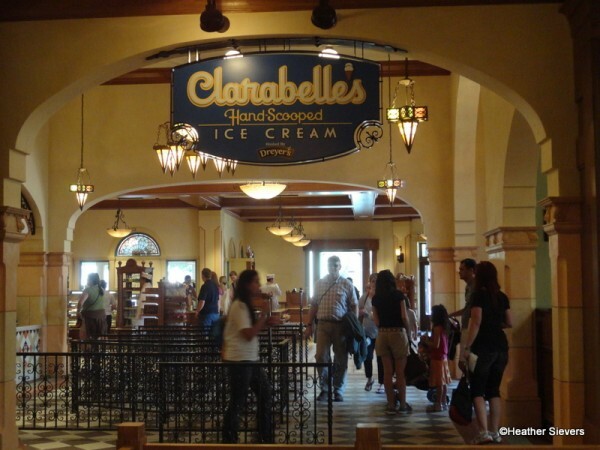 The specialty sundaes offered here at Clarabelle’s are park standards. You’ve got the Chocolate Chip Cookie Hot Fudge Sundae, the Strawberry Sundae, the Mint Sundae, & the Mocha Sundae, all which I have seen before. Something new and pretty adorable? 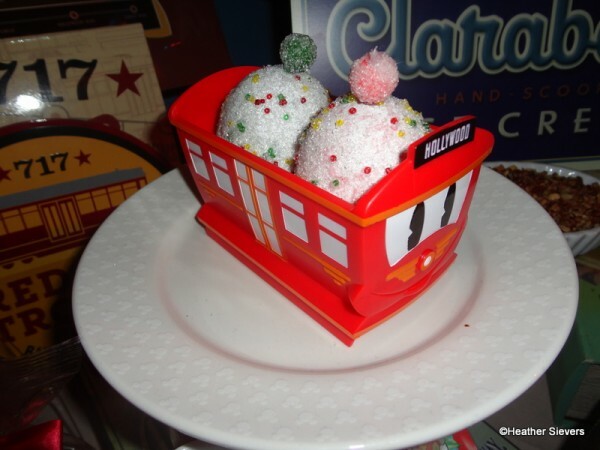 Any sundae can be served in a souvenir Red Trolley cup for $5.00 more. Now, on to what I’d been waiting for! 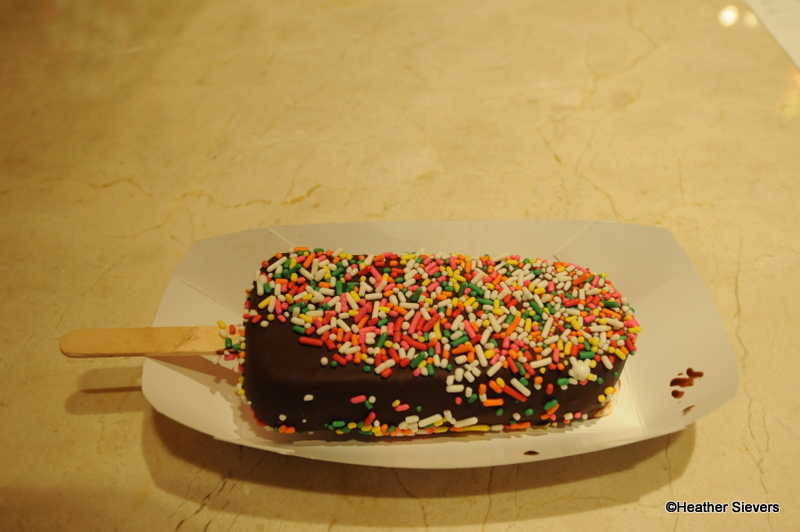 The brand new-to-the-resort menu item: The Hand Dipped Ice Cream Bar. For $4.99 you can choose from three different ice cream bar flavors. There’s Vanilla Bean, Chocolate, and Mixed Berry Sorbet. After you’ve chosen your ice cream, you then move on to your “dip” choice: dark or milk chocolate. Finally, you choose the toppings. I actually thought there would be more toppings, and was surprised to see that there were no nut options like crushed almonds or peanuts. The choices were chocolate chip morsels, confetti Mickeys, blue raspberry bursts (think POP ROCKS! 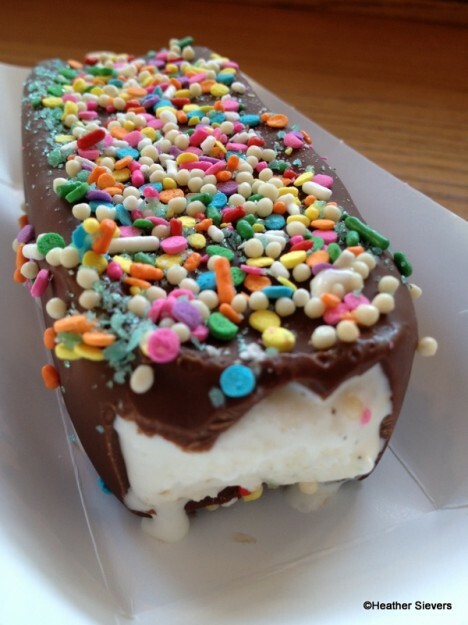 ), and rainbow sprinkles. If you can’t make up your mind, like me, you can order “The Whole Herd” and get a little bit of everything on your ice cream bar! 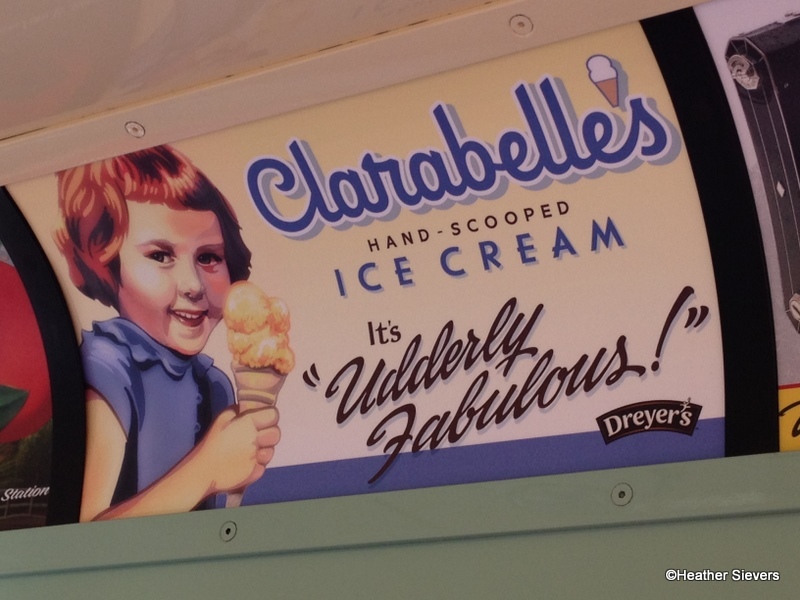 I’m happy to report that the ice cream bars were fabulous. The vanilla bean ice cream was great, and the chocolate didn’t melt too fast, which made it easy enough to eat without making a total mess. I also like the little trays the bars are served in because they catch any toppings or chocolate pieces that would otherwise be lost! I really love the story and decor ideas behind Clarabelle’s. 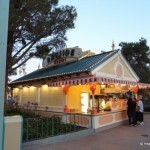 I’m also excited about the new addition of hand dipped ice cream bars at Disney California Adventure. 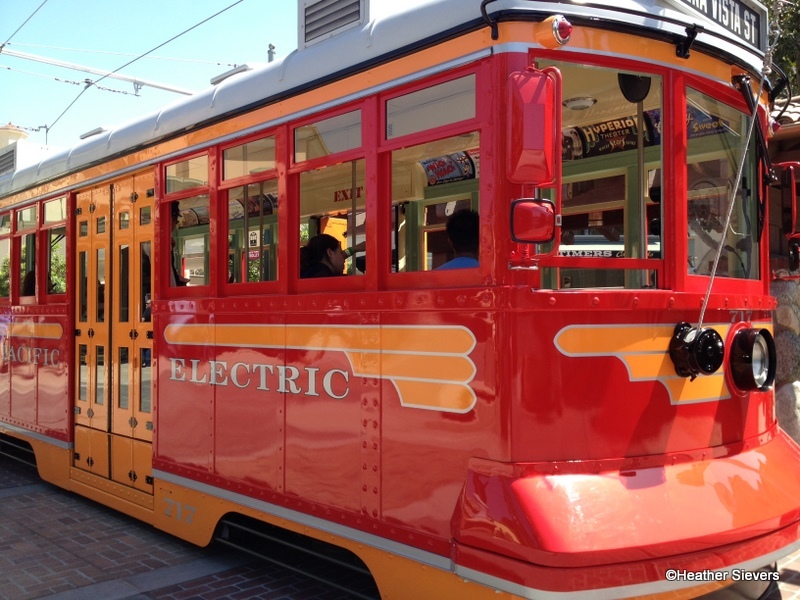 The location is fun, too; who wouldn’t want to take a trolley to the ice cream shop!?! 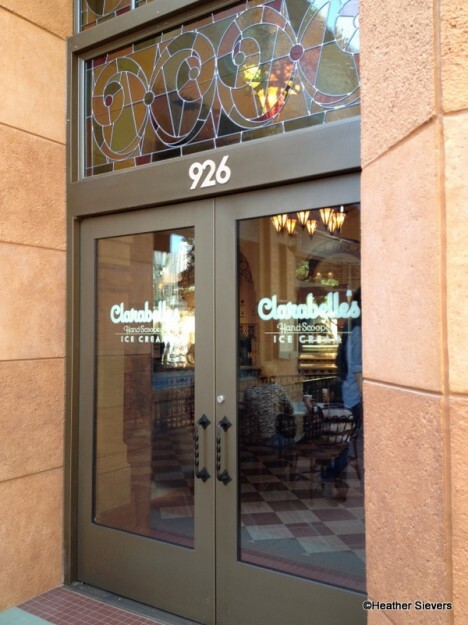 Will you be visiting Clarabelle’s on Buena Vista Street on your next visit to DCA? What would YOUR ice cream bar toppings be? That really looks like fun, I’m thinking that with all the new stuff up there it might be time to try another trip to DL / DCA. 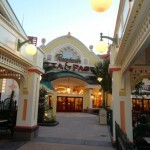 Saying that though, I wish they’d get something similar in WDW. The different options on the ice cream bars look fabulous, yum! Wow! The details in this place look amazing! 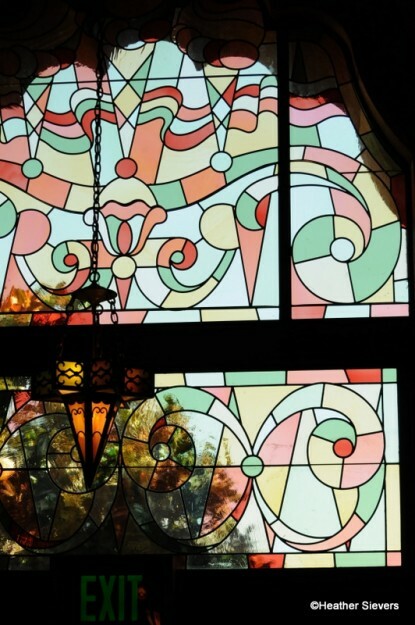 I keep staring at the stained glass and wishing I could see it in person. Thanks for reporting on this! Do you know if the mixed berry sorbet is non-dairy? We’re headed to Disneyland in a few days and I’m trying to get a list of treats my dairy-allergic kid can have. Wonderful post! I’ve shared it with our followers at The Disneyland Gazette. This looks awesome. I’m starting to get jealous of all of the new stuff at DL… wish they would bring some of it to WDW. It’s looks so amazing. The details are unbelieveable. But isn’t it disappointing that the acual ice cream is crappy Dreyers? Filled with air…. I’m with Tim! 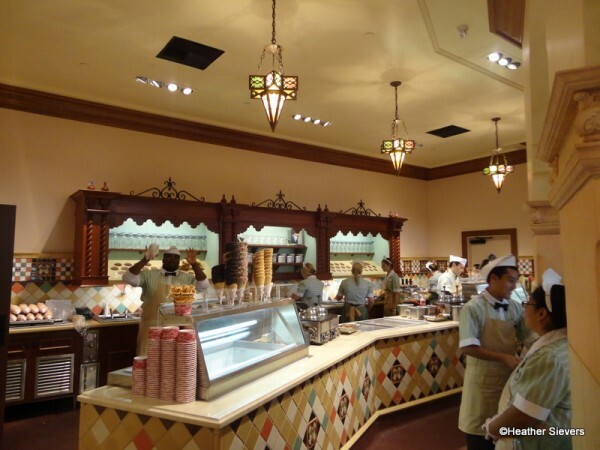 I couldn’t help but roll my eyes at Disney’s backstory about “farm-fresh dairy products” and “old-fashioned churns” when they’re serving flavorless, mass-produced Dryer’s. (And “hand-scooped”? How else would you scoop ice cream? By robot arm?). But then I saw the photo of the adorable souvenir trolley dish and all was forgiven! @James – I love the details too! The pictures don’t do it justice, the stained glass is even more gorgeous in person! @Kristin – I believe it is non dairy, but I’m not sure if they sell them “undipped.” Def worth asking though! 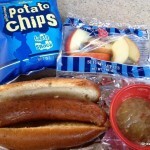 @Connie – Thanks for sharing! @Tim & @ Carrie – I am with you two 100%, I would have LOVED to have seen a local creamery come in and have the ice cream made on site. It would be so fun too see the process and have flavors unique to the park. I normally don’t buy ice cream in the parks because I can get Dreyer’s at the grocery store if I wanted to… The ice cream bars though, are a great addition, and at $4.99 I think they are fairly priced. Nice write up. Thanks for all the shots of the interior. I really liked seeing the lights and the stained glass, very pretty. LooKs lovely!! Will peek in when I’m there! @Aaron – Thanks! They are even more lovely in person! 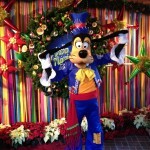 @DayDreamingDisney – I think so too! How will I ride the rides when I’m eating all these great snacks?! I’m not that surprised by the lack of nuts as toppings. Given that kids are increasingly likely to be allergic to them, it’s a good move by Disney to be aware of that in their offerings. 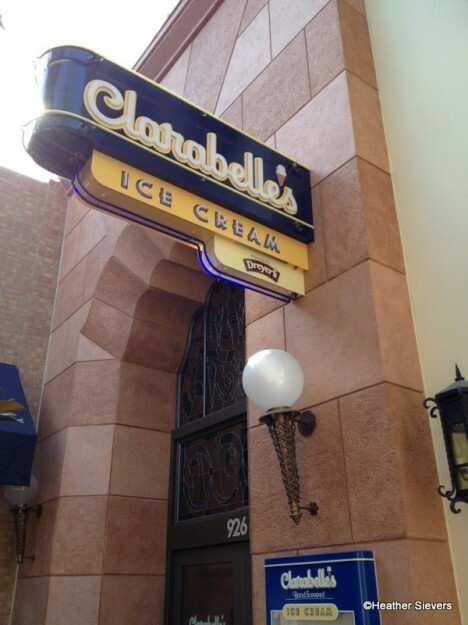 I just visited Disneyland Resort and tried they ice cream bars!! I had mixed berry sorbet with dark chocolate dip and confetti!! It was amazing!!! Had a sundae here last week. Was really looking forward to it, but unfortunately I got an undercooked cone, and the hot fudge was barely there. My friend and I both couldn’t find much of it in our sundaes. 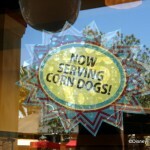 Next time we’ll pay the extra and go to Ghirardellis. I may try the ice cream bar some day, but I really like nuts. None of the sugar toppings appeal to me. 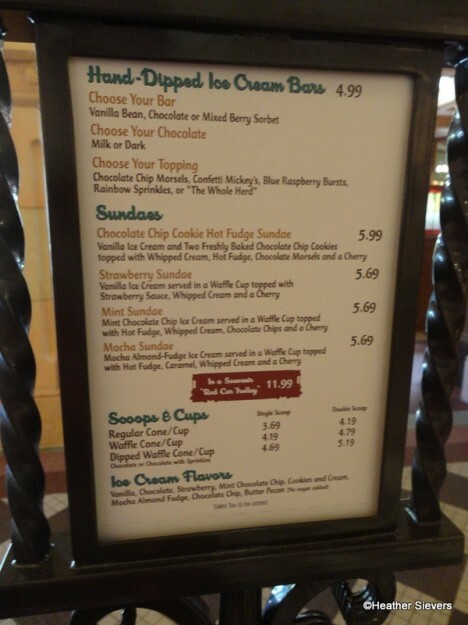 Oh, and a sundae in the Trolley cost $12. Just didn’t seem worth it for cheap plastic. 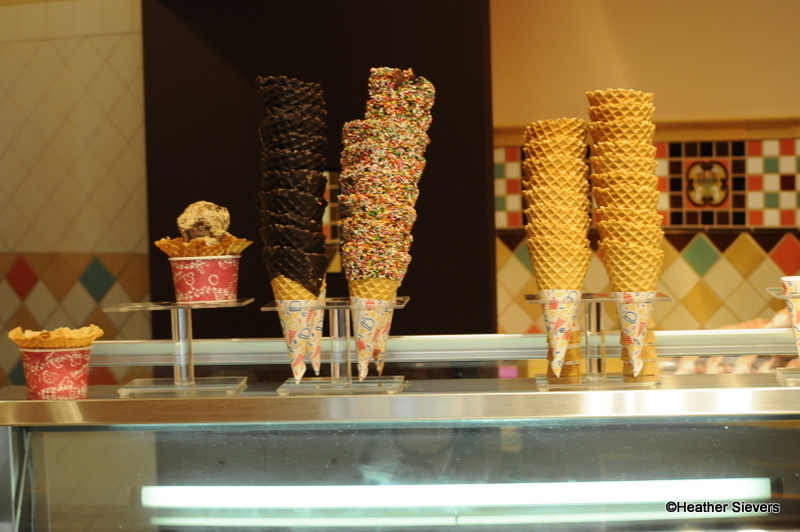 I wanted to try something from Cozy Cones, but that cone was closed all day due to some malfunction. I will try Clarabelle’s again, but maybe I’ll just get a scoop or two and keep it simple.